Finding the perfect walking shoes…..and other fairy tales. In a perfect world there would be perfect walking shoes. Or so I keep thinking. A while back I noticed that the shoe stores had stopped carrying my shoe size. “Do you have this one in a five and a half?” I’d ask, dangling my latest find under their nose. I wasn’t prepared for the answer. “Oh, we don’t carry that size anymore.” It was like they had erased me, banished me to the corner, sent me to bed without dinn er. Something just didn’t add up. But it was true, they had stopped carrying my size. And, this was true in retail stores and online. And the awful truth was that many manufacturers had stopped MAKING size five and half. So, now I am banished to shop in my pajamas in front of the computer. 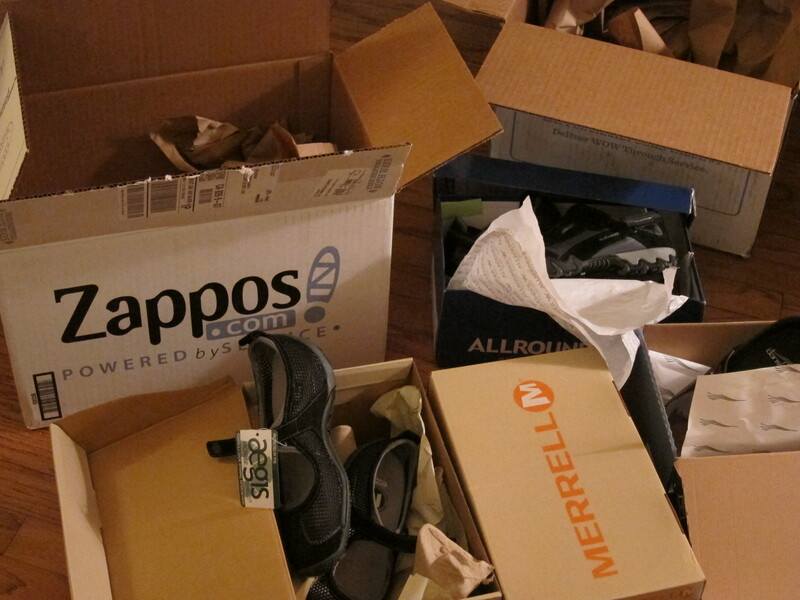 All I can say is this… thank god for Zappos.com! Now that my Italy trip is three months away, I’ve started shopping for my perfect walking shoes. That means I order 5 pairs or more at a time, have them shipped to the house, try them on and send them back. All, until I find the perfect substitute for the perfect shoe. I spent my last trip in Merrell Jungle Mocs. Heaven in a shoe. I’m buying these again. But I’d also like some walking sandals or summer shoes. So the search goes on.